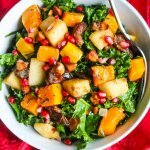 Butternut Squash Apple Kale Salad is a delicious healthy Fall harvest salad that is perfect for the holiday season. Sponsored by Peapod. 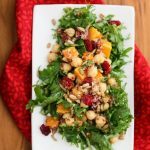 I created this festive fall harvest salad for Peapod’s holiday entertaining theme. 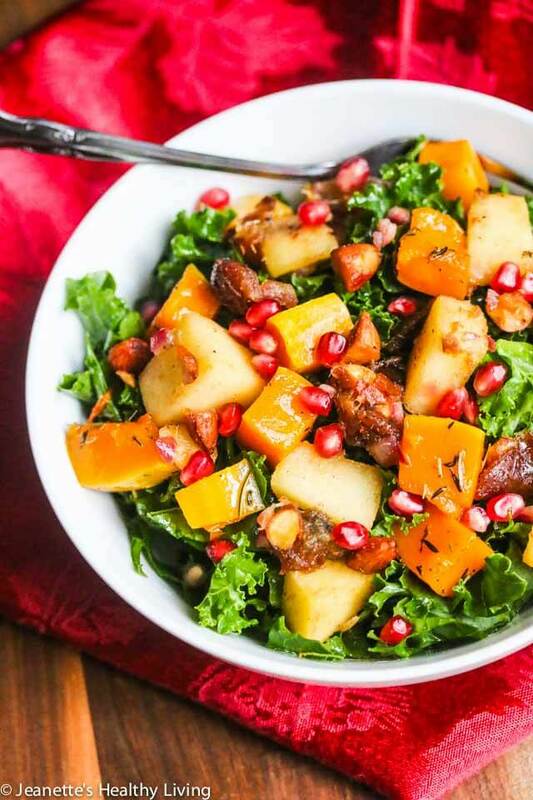 Butternut Squash Apple Kale Salad is perfect for the holiday season. 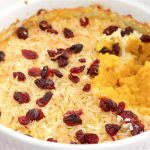 Hearty kale is dressed in a light maple apple cider vinaigrette, then topped with thyme rosemary-scented roasted butternut squash, a sweet and savory warm apple date almond compote topping, and jewels of pomegranate seeds. 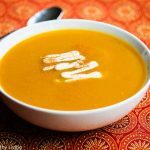 Butternut squash is one of my favorite winter squashes. 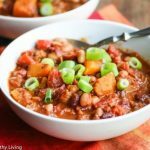 It’s sweet and mild, and not starchy like sweet potatoes. 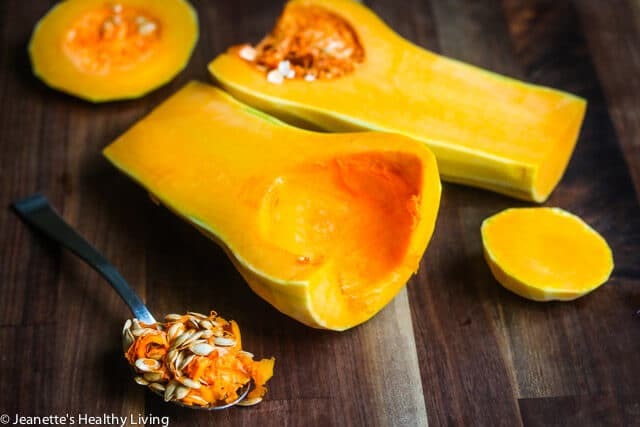 Butternut squash is a wonderful source of carotenes, vitamin C, potassium and magnesium too. 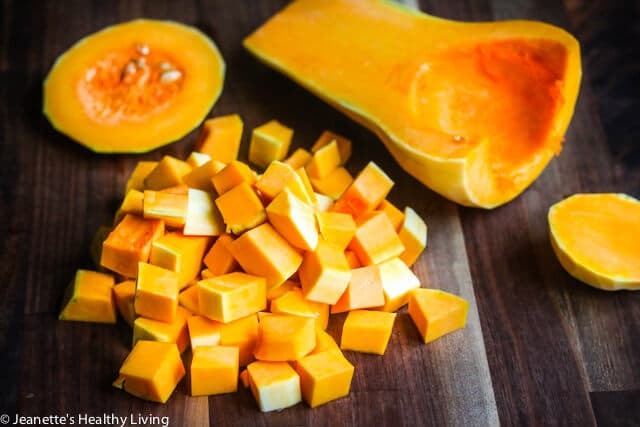 If you’re intimidated by buying a whole butternut squash to roast, don’t be. It’s easier to prepare than you think. 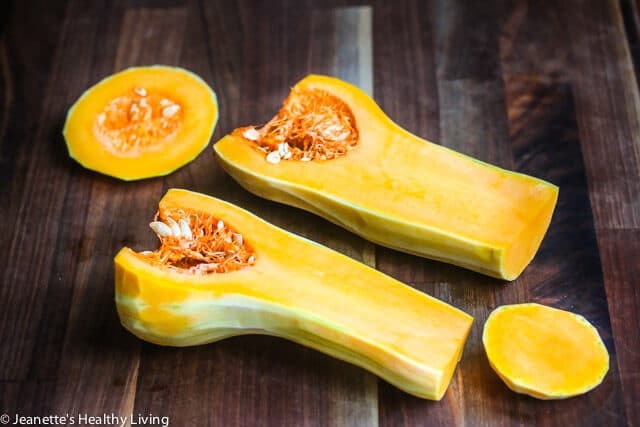 There are several ways to roast butternut squash. I’ve roasted butternut squash whole for pureed soups, roasted halved butternut squash, and roasted butternut squash cut-up. First, there’s roasting a whole butternut squash. Roasting butternut squash whole has the great advantage of zero prep. 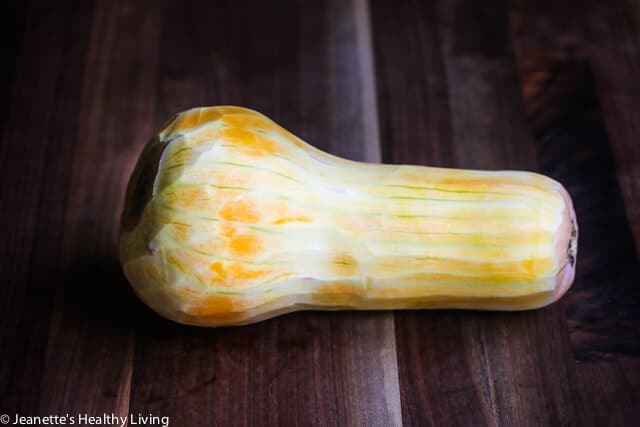 You literally roast the entire butternut squash in the oven for about an hour at 400 degrees. 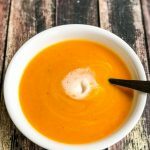 This works particularly well for pureed butternut squash soup. scoop out the seeds, and lay with flat side down on an oiled baking sheet. Roast for about half an hour at 400 degrees. The flat side ends up with a little caramelization, which adds extra flavor. 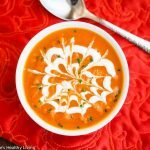 I like this for soups and mashed butternut squash dishes. Third, there’s roasting cut up butternut squash. This requires a little more work, but ensures even roasting and more caramelization. 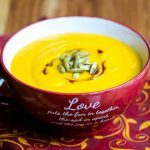 Roasting butternut squash with herbs is an excellent way to infuse flavor into this winter squash, and yields a nice balance of sweet and savory flavors. Roasted butternut squash and kale go together nicely. 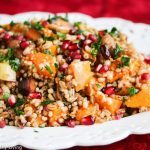 To add finishing touches to this fall salad, I made a light maple apple cider vinaigrette, then topped the salad with a sweet and savory warm apple date almond compote topping, and jewels of pomegranate seeds. I suggest letting the kale salad marinade in the maple apple cider dressing for a little bit to soften the leaves before serving. 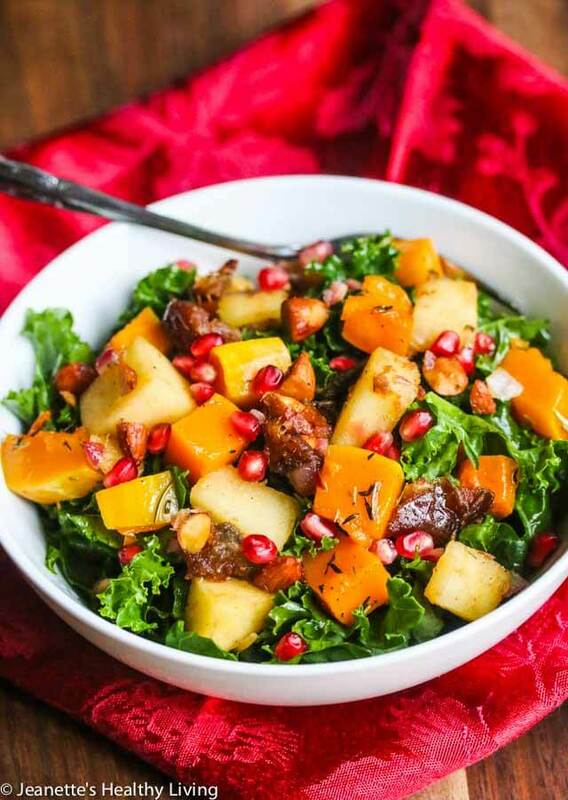 Enjoy this Butternut Squash Apple Kale Salad during the holiday season. 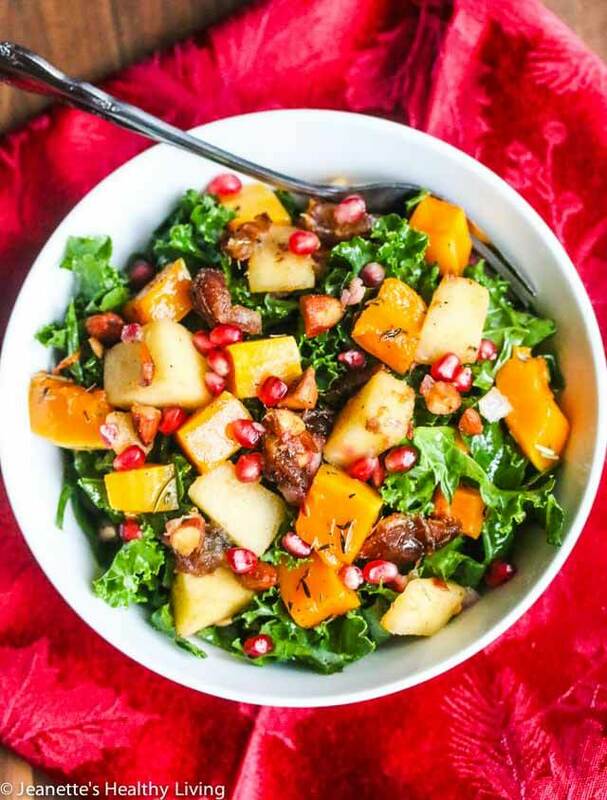 Kale Butternut Squash Apple Salad is a wonderful side dish for the holidays. 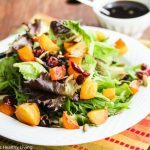 Warm apple compote and herb roasted butternut squash provide a nice sweet and savory contrast to this salad. Toss butternut squash, thyme, rosemary and olive oil together; season with salt and pepper. 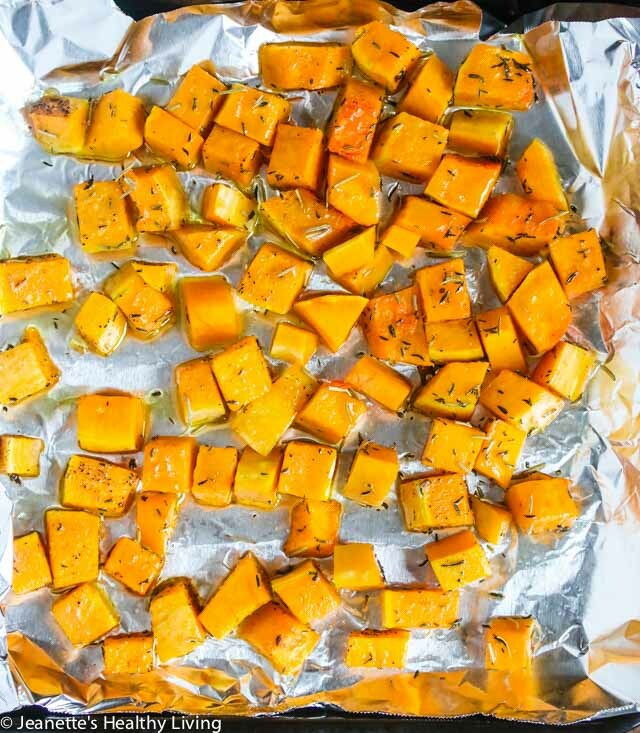 Spread in a single layer on a foil or parchment paper-lined baking sheet.Bake squash until tender, about 15 minutes. Melt butter in a saucepan. 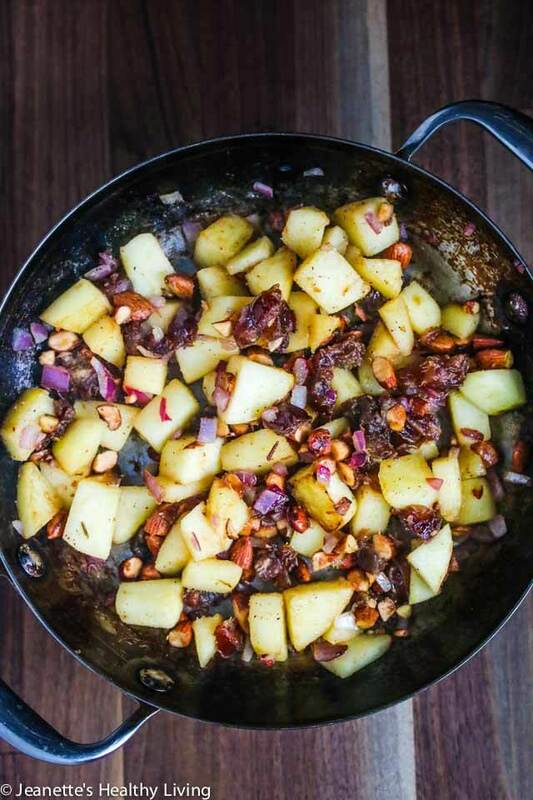 Add apples, dates, almonds, and onion. Saute a few minutes until apples start to just soften. Sprinkle with lemon juice and turn off heat. Season to taste with salt and pepper. In a small bowl, whisk together maple syrup, apple cider vinegar and olive oil. Season to taste with salt and pepper. 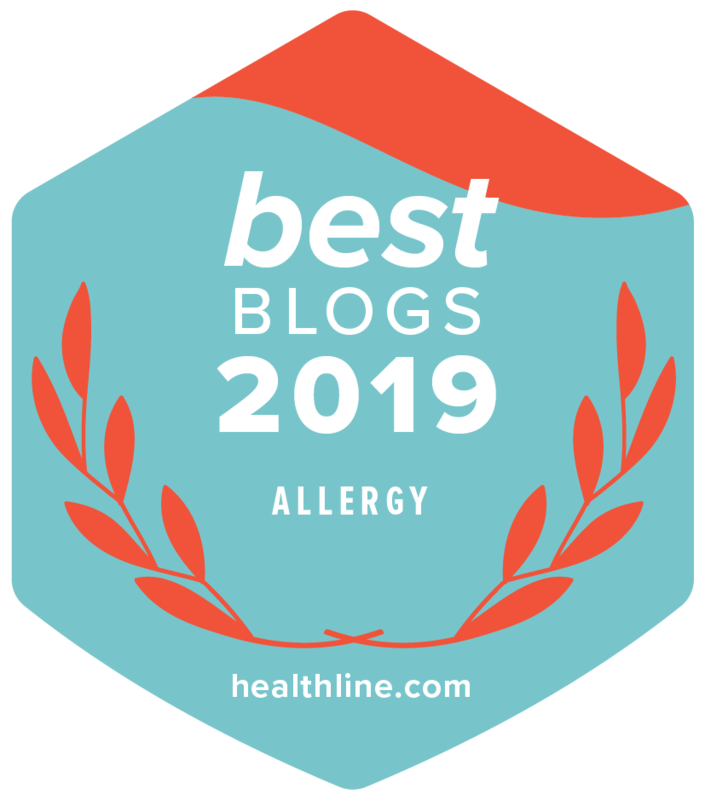 Toss kale with salad dressing. Divide kale among six salad bowls. Divide roasted butternut squash and apple compote among salad bowls. Sprinkle pomegranate seeds on top. Haha, so since I’m away at school, by mom is left to her own devices and she told me she bought a spaghetti squash and tried to scrap it out and it was a mess. 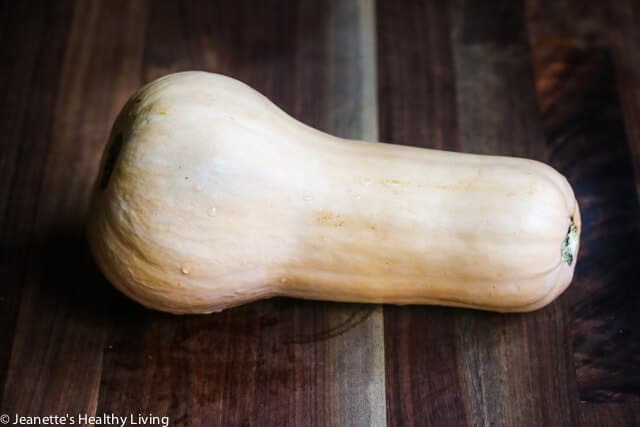 She later found out that no….what she had was a butternut squash 😛 Bahaha! She needs me cooking for her! This is the kind of salad that I can eat every day! This looks amazing! Can’t wait to try it! Thanks for the fabulous recipe.